Fr. Brandon Macadaeg is a native of the East Bay. He was ordained to the priesthood in 2013 for the Diocese of Oakland. Currently, he is the Parochial Administrator of St. Lawrence O’Toole-St. Cyril of Jerusalem Parish and St. Paschal Baylon Parish, both in Oakland. Previously, he served at Holy Spirit Parish in Fremont, holding variety of positions, initially as Parochial Vicar, then as Interim Principal of the school, and lastly as Interim Parochial Administrator. In addition to his pastoral duties, he is the Spiritual Director of the Confraternity of Eucharistic Devotion, Diocese of Oakland. Fr. Macadaeg holds a Bachelor of Sacred Theology (STB) from the Pontifical Gregorian University in Rome. He also attended the School of Philosophy of the Catholic University of America as a Basselin Scholar, obtaining both a Bachelor of Philosophy (Ph.B) and a Licentiate of Philosophy (Ph.L), submitting a thesis entitled, Natural Law and Natural Rights in the Philosophy of Jacques Maritain. Fr. Macadaeg’s academic interests include Political Philosophy, Sacramental Theology and Liturgy. Fr. 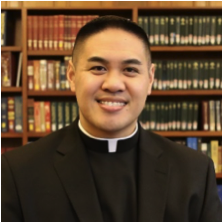 Macadaeg joined the faculty of St. Patrick Seminary in 2018 and teaches Homiletics I in the Pastoral Studies Department.